These are like the good old days of France and Belgium. Things are moving so fast that it's difficult to keep up with the war. General Simpson's 9th Army continues to rout the German 15th Army after reaching the Rhine in two places. The 35th Infantry Division is on the outskirts of the town of Geldern, and at one place is only some five miles away from the Canadians, attacking from the north. 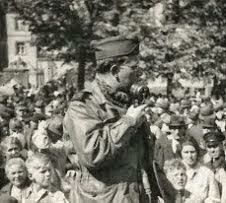 The 83rd Infantry Division has virtually cleared the town of Neuse, just across the Rhine from Düsseldorf. Doughboys say the Rhine looks like any other river . . . wide, deep and wet. All in all, advances generally ranged from 4 to 10 miles on the 9th Army front yesterday last night. So many towns and villages were taken that no one has bothered to add them up. Prisoners up to the present count for the past 24 hours total more than three thousand. The news from the 1st Army front is just as good, although not quite so sensational. Gains up to five miles were made yesterday and last night, and the 8th Infantry Division . . . stands a little over five miles from the Cologne city-defenses. Biggest advances on the 1st Army front were made in the southern flank of the drive where the infantry and armor are swinging around to the upper reaches of the Erft River.
. . . On the plain in front of Cologne, armored units northwest of the city have a bridgehead six miles deep across the river. Heavy Nazi resistance has been encountered there. The 9th Army's advance to the Rhine has created a big sack on this side of the river, threatening to trap the retreating German army. 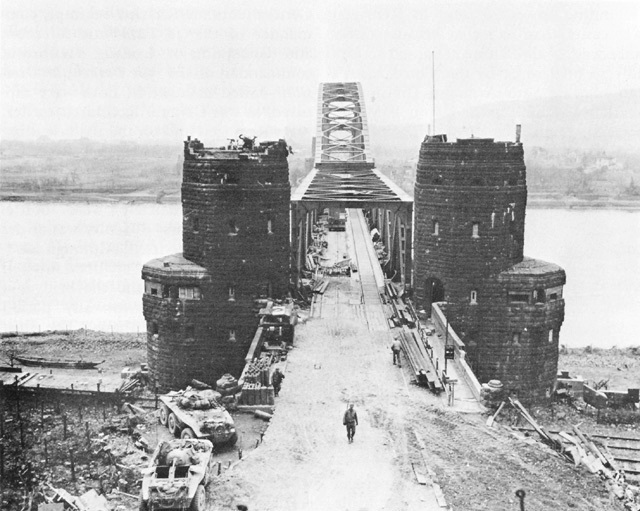 The Rhine-crossings around Cologne now are a matter of life and death to the Nazis. They can be expected to fight bitterly for them and for the road networks leading to these crossings. Prisoners to whom I've talked the last few days are confused and shocked by the force of this offensive. In one group of prisoners captured, there were members of the Luftwaffe, men from the Panzer Divisions, parachutists, Volks Grenadiers, Volkssturmers, and regular army men; and all of them were fighting as infantry. This makes German confusion west of the Rhine pretty complete. I have just returned from a narrow strip of land east of the historic Rhine River, where one of the most important battles of this 20th Century civilization is just beginning. Yes, I said "east" of the Rhine, east of Germany's Old Man River. The United States 1st Army has a firm and solid bridgehead into the low, rolling, wooded hills across the river south of Cologne. And the bridgehead is being reinforced and is growing every hour. This is a surprise victory, a lucky throw of the dice of war that has sent us across the Rhine. I can't tell you the details right now, but it's a story of courage and daring that has been matched in this war since the invasion of Normandy. The enemy has been caught with his pants down. It was only this afternoon, twenty-four hours after 1st Army troops crossed the Rhine, that there has been any resistance from the Germans. I was on the Rhine when the artillery began to hit our assault troops, but there was only a breathless kind of firing by 75 mm. guns that was doing now harm. Although I can not locate for you the specific part of our bridgehead east of the Rhine, there is no military security involved in telling you that we have made our new attacks in one of the most spectacularly beautiful sections of the Rhine Valley. The crossing was made at a place where, only four hours before, hundreds of German soldiers were fleeing across the river. We had taken at least one village across the Rhine when I left the bridgehead at 3:00 o'clock this afternoon. We got to the high bluffs, looking down on our crossings, last night. The enemy has no direct observation on the spot, for our troops are pouring across in greater and greater numbers. This crossing of Hitler's last major water-barrier in the west is another example of the daring of General Hodges' 1st Army. The 1st Army has earned one of the greatest reputations in American military history since it invaded the coast of France, nine months ago. The United States Joint Chiefs of Staff are spending the weekend conferring with High Commissioner John J. McCloy and other top American officials in Germany. Tomorrow they will hold their first strategy conference with foreign military men when they meet with representatives of Luxembourg. The talks are top secret, and the visit of America's highest military leaders has again focused the attention of conquered Germany on the ever-present possibility that a shooting war could replace the Cold War struggle now going on between East and West. The Communists here have finally received their propaganda instructions after several days of suspicious quiet concerning the military talks. The Russian-licensed National Zeitung starts off the party line with a front page banner headline declaring that the "US Chiefs of Staff Arrive for Mercenary Research." Western Germany is to be the military training ground for the North Atlantic fleet, the newspaper declares. It goes on to say that the visit of the three top military leaders marks a new chapter of American history: armed intervention in a foreign land during peacetime. The Communist paper calls the American staff directors "bankers in the uniforms of generals" who are in Europe to arrange profits for US war industries. It charges that America's war plans call for the United States to contribute the atom bomb while Europe supplies the human lives. Generals Bradley and Vandenburg and Admiral Denfeld will leave for London on Tuesday, where they will continue their conferences with their British opposite members. On Thursday a meeting is scheduled in Paris with Field Marshal Montgomery and French, Belgian, and Dutch military authorities. They will then go to Rome and Vienna before returning to the United States. Today is the last day of the airlift, and beginning tomorrow work will start on the redeployment of between sixteen and seventeen thousand men called from all over the world to defeat the Russian blockade of Berlin. General John K. Cannon said that most of the men would be returned to the bases from which they were called. Only two troop carrier groups of about thirty-six planes each will be left in Germany when the staging out is completed. The Burtonwood, England base will be eliminated as a major repair station. The British are sending home about five thousand RAF men, leaving only two squadrons in Hastings. I have learned through a confidential source that the Soviet military administration is conducting a widespread investigation into a series of mysterious explosions in the Soviet zone which indicate that a German underground movement is operating against the Communist occupation authority. The latest attack is reported to have made last Monday in Potsdam, on the outskirts of Berlin, when a charge of dynamite damaged a Russian headquarters building. There have been other reports of Soviet military trains being derailed by explosives. So far eight Russian soldiers, including one officer, have been injured. The nature of the suspected underground movement has not been determined. Both Eastern and Western occupation authorities have been on guard against a possible secret organization of former Wehrmacht and Nazi leaders. There have been no such incidents in the three Western zones. High Commissioner John J. McCloy left Frankfurt for the United States today for two weeks of consultations in Washington. 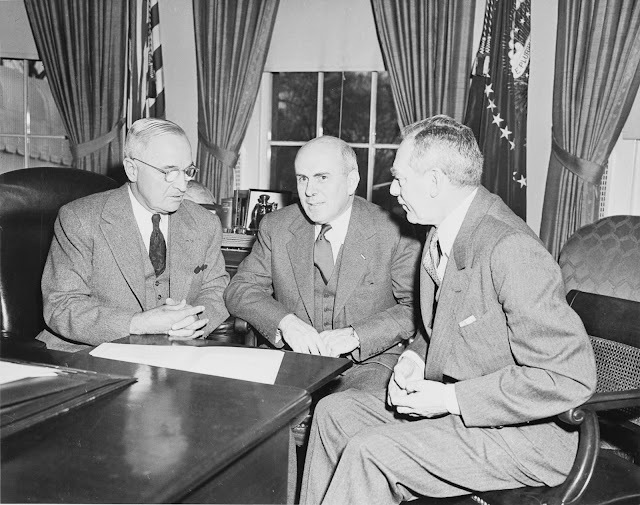 His departure came less then twenty-four hours after announcing an overall reorganization of the American occupation machinery which will work with the new West German government as a civilian organization replacing the military government that has conducted affairs here for the past four years. The McCloy plan consolidates a number of functions which will cut down the cost of our occupation. The High Commissioner for Germany will have a cabinet of eight deputies each heading a major operational division such as Economic Affairs, Political Affairs, Military Security, and so forth. The new program makes McCloy chief representative of the State Department as well as head of the ECA Marshall Plan organization, which will earmark funds to project the West German economy in the European Recovery Program. America's fiery commander of the British military post, General Frank Howley of Philadelphia, has also resigned his job. Howley, who has been in military government since he was appointed commandant of Cherbourg early in the invasion, says he wants to return to civilian life. The new Berlin commandant, according to reliable sources, will be General Maxwell D. Taylor, former member of West Point and now Chief of Staff of the Army's European Command. Germany's election campaign is heating up, and today we have news of the campaign's first casualty. A Communist election worker was stabbed to death in Eastern Bavaria yesterday at a party rally. The victim was a clothing worker. The assailant was a 25-year-old refugee shoemaker who claims membership in the right-wing Christian Social party. The shoemaker said he stabbed the Communist clothing worker because he became exasperated during a political argument.